Ideally a turbocharged engine will spool up, achieve target boost and match the per RPM boost targets set in the engine mapping all the way to redline. On a system experiencing boost creep, target boost is achieved followed by boost increasing beyond target in an uncontrolled fashion. 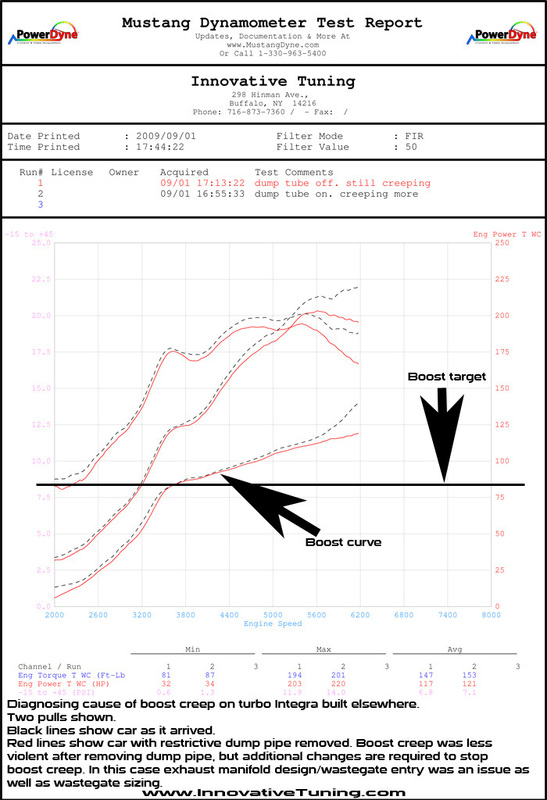 In some cases an engine may hit the boost target then rev out 1000 RPM or more before boost goes over target. This is not to be confused with spiking, which is boost jumping over target as soon as the turbo spools up, then settling back down on target. This is also not to be confused with simple overboosting in which boost pressure goes over target as soon as the turbo spools and remains over target until the operator reduces throttle, an overboost safety limit engages, or something breaks. Overboosting can generally be remedied by altering boost control settings or fixing mechanical faults i.e. vacuum line to wastegate popped off/tore unless the underlying cause of the overboost condition is boost creep. Boost creep is caused by a fully opened wastegate not being able to flow enough exhaust bypassing the turbine wheel. Bypassing exhaust energy from the turbine wheel slows turbo shaft speed which reduces intake airflow and thus reduces boost pressure. Remember the turbine and compressor wheels are joined by a common shaft, so as the turbine wheel is driven faster, compressor wheel speed increases as well. As compressor wheel speed increases, more airflow is forced into the engine. Boost creep is a mechanical issue rather than one in engine management tuning or boost controller adjustment. Adjusting a boost control solenoid or manual boost controller (MBC) effects boost level by altering when, how far and how often per second the wastegate opens. If a boost control setting is resulting in the wastegate being held all the way open, you can reduce boost control solenoid duty all the way to 0%, unplug the boost controller electrically or turn your MBC all the way down and boost won’t go any lower because the wastegate is already at max flow. If you’re unfamiliar with turbo operation and don’t have time or interest in learning how they work, here’s a basic analogy that will hopefully help you understand boost creep. Think of turbo speed like a car being driven by someone who likes to use both feet. The engine exhaust output would be the throttle pedal and the wastegate the brakes. As you apply greater “throttle” (engine exhaust output) the turbo spins faster unless you also apply the brakes to keep speed under control. If engine output overcomes the “brakes” (wastegate flow), the turbo will accelerate beyond desired speed, causing boost to go over target. This would be boost creep. Because there are so many combinations of parts, install procedures and situational factors that can cause boost creep and they’re application specific, I won’t attempt to run through them all. Drivers who have not experienced boost creep before may experience the issue the first time they drive their vehicle under a certain ambient temperature. In the cold (up to a certain point) the engine operates more efficiently and operators may essentially experience too much of a good thing (engine airflow) causing the turbine to spin beyond the shaft speed required to achieve target boost on the intake side. In this case absolutely nothing about the car has changed, just the environment it’s being operated in. Factory intake and exhaust systems are generally more restrictive than aftermarket performance parts. Upgrading intake and exhaust components may induce boost creep where it was not present before. An increase in flow into and out of the turbo requires an increase in wastegate flow to maintain target boost pressure at each RPM. If wastegate flow is near capacity prior to installing intake/exhaust upgrades, or those upgrades cause a large increase in flow, freeing the system up can put the wastegate flow requirement beyond capacity at which point the boost level becomes out of control. Remember some combinations of intake and exhaust parts flow better than others. A friend with the same car may not experience boost creep while you do if their intake/exhaust don’t flow as well as yours. Something as simple as fixing pre turbo exhaust leaks or charge pipe leaks which were masking wastegate inadequacy can also unveil a boost creep issue. If air is leaking out of the charge piping, an undesired boost pressure increase will be less likely to occur. If anything you’ll be over spinning your turbo just to try to reach the boost target. If exhaust is leaking pre turbo, there’s less energy driving the turbo’s rotating assembly so again the turbo is less likely to generate excess intake manifold pressure. Because most owners would rather be able to upgrade intake/exhaust components than keep stock parts to avoid boost creep, improving wastegate flow is a common solution. This can be achieved in a few ways. On some systems, the internal wastegate flapper has a significantly larger diameter than the port it covers on the turbine housing. Enlarging the port size closer to the flapper size and improving port entry increases the flow potential of the wastegate. Installation of a larger diameter internal wastegate flapper combined with porting the outlet to match goes a step further. Keep in mind, upgraded wastegate flappers aren’t readily available for all applications and porting the wastegate outlet doesn’t always improve wastegate flow enough to halt boost creep completely. Improving exhaust flow out of the internal wastegate is also helpful. This is more of an issue on some applications than others i.e. DSMs, making aftermarket turbo outlet/o2 housings a common upgrade. Using an external wastegate with greater flow capacity is another option. In this scenario the internal wastegate is often disabled rather than being used in conjunction with the external wastegate. External wastegates generally offer easy replacement of the spring(s) providing greater range of adjustability while providing rock solid boost control. Because an external wastegate is not part of the turbo, the wastegate can be retained when you swap out turbochargers if fitment allows and wastegate flow is adequate to keep the various turbos under control. If you already have an external wastegate and are experiencing boost creep, keep in mind that upgrading the wastegate alone may not solve your issue. Airflow into and out of the wastegate are still critical and poor manifold/inlet pipe or dump pipe design may hamper flow to the point that a bigger wastegate isn’t a solution in itself. Some owners take a different approach by upgrading the turbocharger rather than making changes that allow the existing turbo to function without boost creep. Ultimately this is a discussion to have with your builder/tuner of choice as long as they’re familiar with your application. Upgrading the turbo often requires additional supporting modifications and may introduce other issues regarding fitment or reliability of engine and drivetrain components. Tuning changes are generally required with any of the options I’ve mentioned. You get the idea…talk to a pro and they can point you in the direction that makes the most sense given your current setup, usage and future goals. Keep in mind that online parts vendors often sell parts that induce boost creep because they have no knowledge of installation, tuning and operation of the parts they sell or how groups of parts work together on a given application. A shop that can provide parts, installation and tuning in house will have the experience with various combinations of parts to get you parts that work the first time and keep you from having a boost creep surprise.